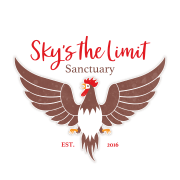 Sky’s The Limit Sanctuary is a non-profit animal sanctuary devoted to saving as many lives of exploited farm animals as possible while providing them an enriching environment safe from harm. We also strive to educate the public so that we may motivate and encourage others to stop the cycle of horrific practices of the animal farming industries. Our goal at Sky's the Limit is to provide sanctuary to discarded and abandoned chickens. We currently sit on five acres of land in Washington State. We focus on rescuing chickens because the need is SO great and we want to maximize the number of lives we can save with the current land we own. In the future, we hope to expand as resources allow. Would you recommend SKYS THE LIMIT SANCTUARY?